Computing and/or programming skills are becoming increasingly sought after by industry as well as the ability to manage and work with large data sets. However, as a graduate student conducting scientific research, these skills can not only open doors for careers outside of academia, but also supplement your current research projects through learning how to streamline data/statistical analysis pipelines into reproducible code. This will not only save time in the long-run, but you will be able to contribute to the growing demand for science that is open and reproducible. UofT Coders is a group of graduate students who hold weekly meetings aimed at raising awareness and building skills around programming related to science research through workshops and tutorials. Share your coding skills and favourite tools with your friends, fellow students and colleagues in friendly, no-pressure work-alongs. Share your coding skills and favourite tools with your friends and colleagues in friendly, no-pressure work-alongs. Here is a list of lessons that have been led by graduate students such as yourselves. If you have an idea for a lesson that you’d like to see (or teach! 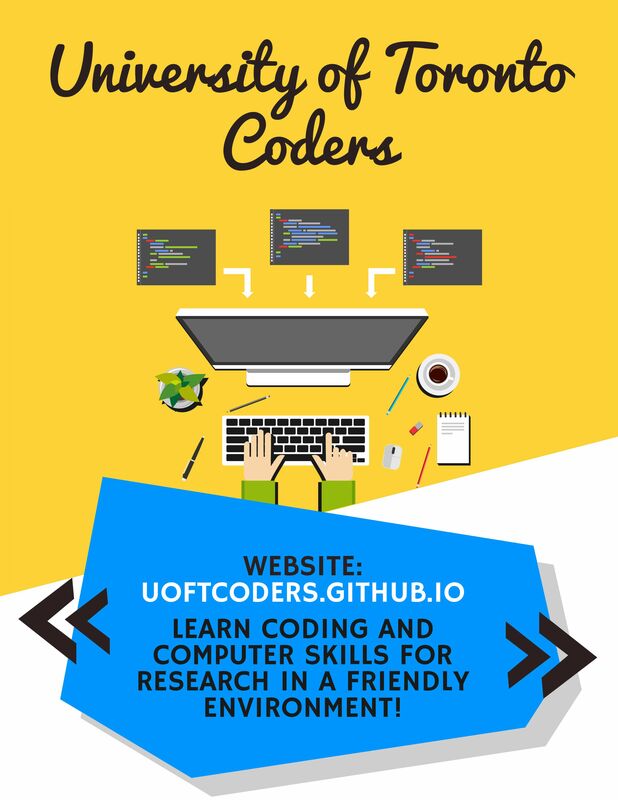 ), let us know here or email us at uoftcoders@gmail.com! Get together to work on your coding projects, help each other out and share your work. Even if you’re just starting out, or curious how computational skills can help you in your research, this is the perfect place to have the discussions to find out more.